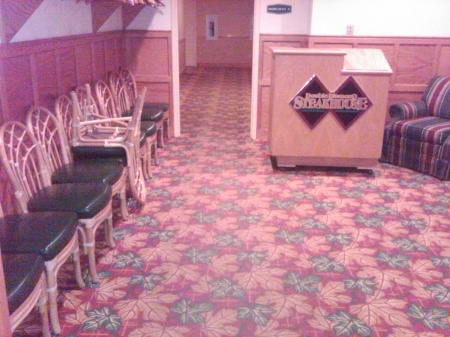 Decorative concrete overlays are a great solution for interior or exterior concrete flooring. A concrete overlay can be very thin, 1/16th of an inch or up to 1/2 an inch or more depending on your situation. 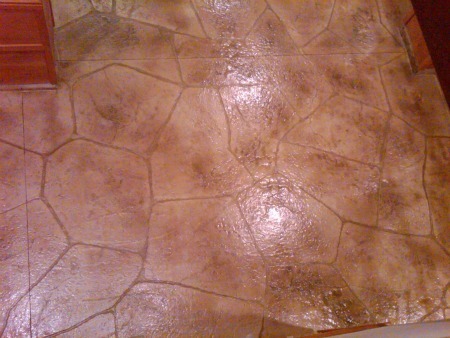 On the page below I'll explain to you how to do a thin decorative stamped concrete overlay over a concrete floor. 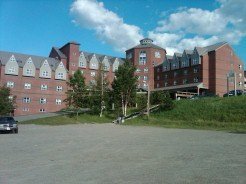 This stamped concrete overlay I'm going to talk about is a project we did at the Sugarloaf Mountain Ski Resort & Hotel in Carrabassett Valley, Maine. 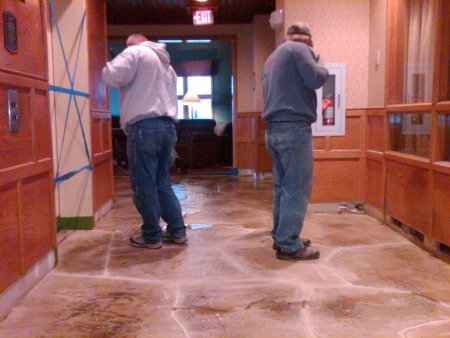 They had 20 year old tile and carpet in the hotel and were looking to update the flooring with decorative concrete. Because they only had 1/4 to 3/8 of an inch to work with they chose a stamped concrete overlay that would look like fieldstone or mountain rock. What the lobby floor looked like before starting. This entire project entailed about 4500 square feet of decorative concrete flooring and included most of the lobby floor and parts of floors two thru six. 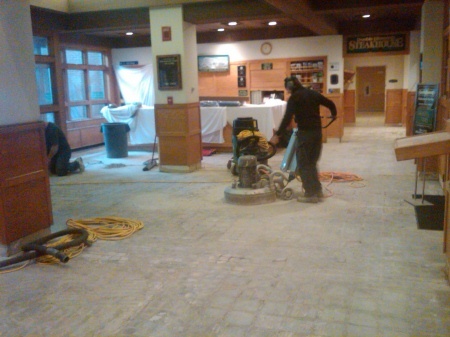 The first step was to remove the old carpet and tile. The carpet pulled up rather easily and the tile chipped off using a hammer drill, but the challenge was removing the glue left over by the carpet and the thinset from the tile. We chose to grind off both the glue and thinset from the concrete floors using hand held grinders and floor grinding machines. This was much quicker than using mastic removers. 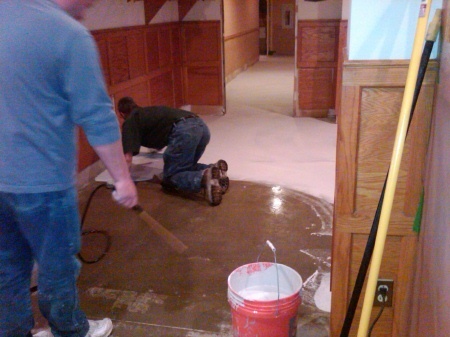 We wanted to get this stuff off the concrete floor so we could keep moving the project along. 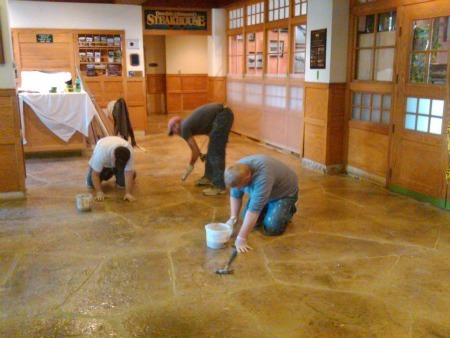 After the glue and thinset was gone, we could start preparing the floor for the concrete overlay. We acid washed the entire floor with muriatic acid, (9 parts water to 1 part acid), then we neutralized the acid with 9 parts water mixed with 1 part ammonia. 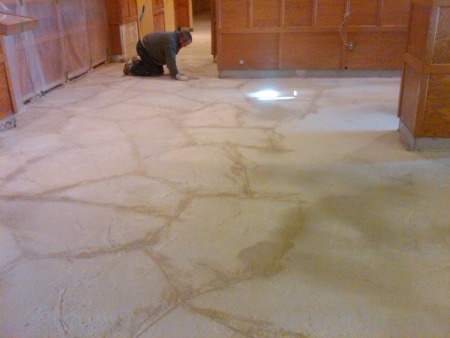 We vacuumed the entire floor to remove all the water and were now ready to start the decorative overlay process. 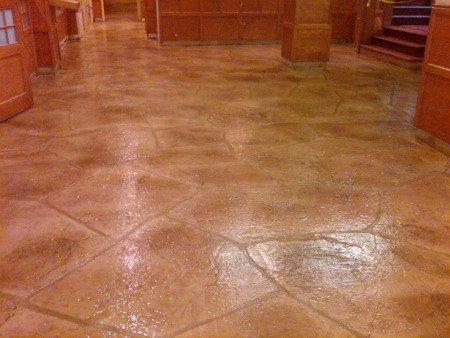 We used Elite Crete's products for this decorative concrete overlay. They have polymer modified concrete overlay products that are very strong & durable and can also be colored and/or stained to just about any color. 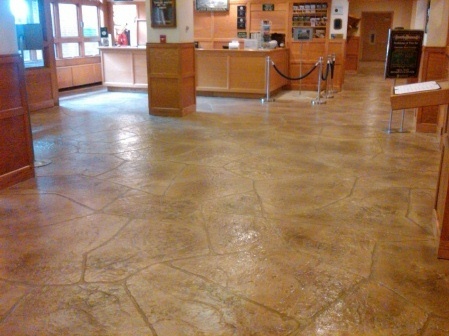 Elite Crete's Texture Pave and Thin Finish were used. 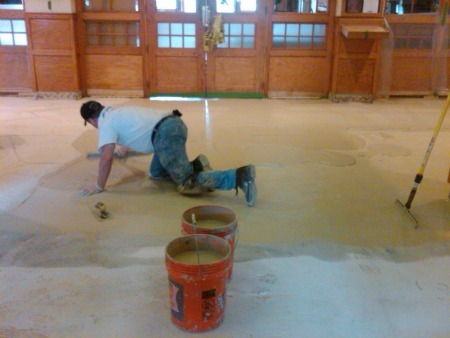 The first coating we applied was a skim coat to prepare the concrete floor for the stamped overlay material. 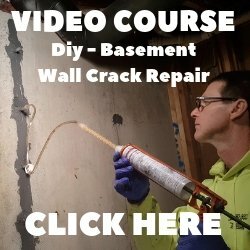 Make sure to dampen the concrete in front of the skim coat. This skim coat (called Thin Finish by Elite Crete) goes on very thin using a magic trowel. 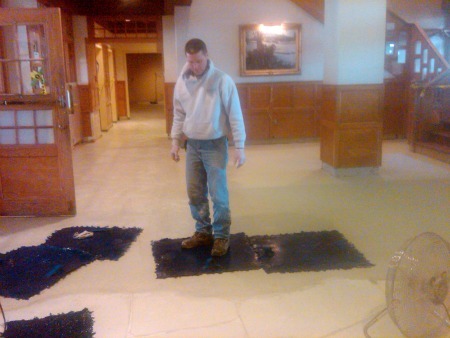 We coat the entire area that is going to receive the stamped overlay and let it dry completely. 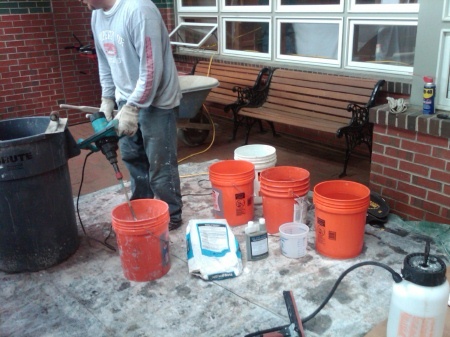 After the skim coat is dry, the next step is to lay the stampable concrete overlay material called Texture Pave. First, we apply another skim coat over the previous skim coat, but while it is still wet we apply the decorative overlay material right on top of it. This creates a really good bond to the concrete floor. Using a gauge rake we rake the material to 1/4 inch thickness over the entire area. The lines left by the gauge rake are smoothed out using a magic trowel on a long handle (kind of looks like a rubber squeegee). 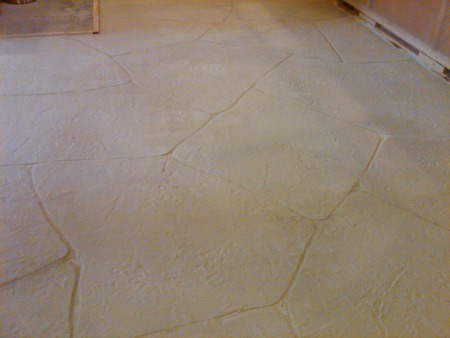 After all the concrete floor is covered with the overlay material we let it dry enough so it's firm but not too hard. Now, we texture the concrete using rubber stamps with a stone textured finish on one side. We spray on a clear liquid release agent so the stamps don't stick to the material and lay the stamps on the overlay material pressing the texture in using our feet. This is where experience pays off, you don't want to get on the material too early or too late, timing is critical. If you're going to try this start on something small. When the decorative concrete overlay material is all textured, we let it dry until it is hard enough to walk on but not so hard we can't carve in the grout lines. 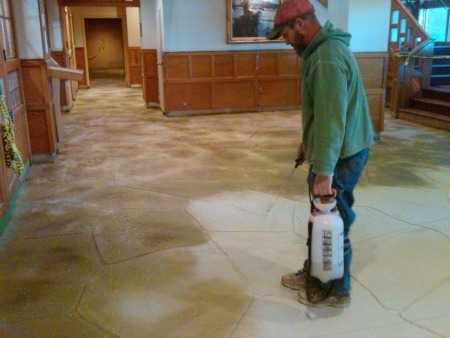 We hand carved the grout lines in this project, that is what the hotel owners wanted. Random looking hand carved stones that was unique and didn't duplicate a pattern. You could use stamps that have all the lines as part of the stamp if you like. 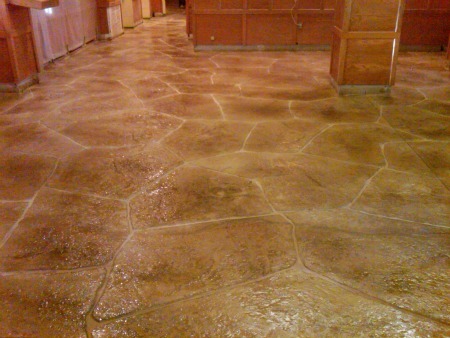 Once all the grout lines were carved and the stamped concrete overlay material looked like large fieldstones, we sprayed on three different colors to make the stones look like real rocks. The main color was beige, we flooded the entire material with this color, and we highlighted with the colors chocolate and charcoal by randomly spraying these colors in different areas. 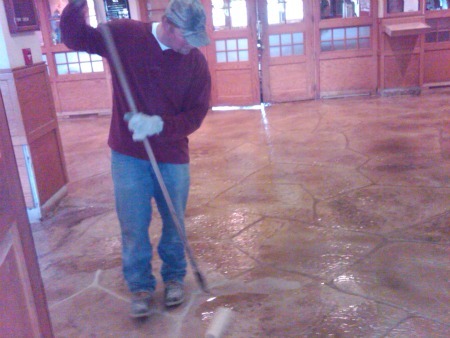 We flooded the decorative concrete overlay material with a beige color first and immediately sprayed the other two colors randomly into the wet beige color for a unique mottled effect. We let the color dry overnight and the next day applied a coat of 2 part epoxy to the tops of the fieldstones making sure we didn't get any epoxy in the grout lines. 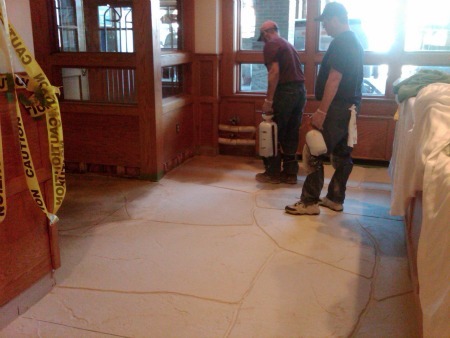 We used a fast setting epoxy (4 hrs set time) so we could grout the lines between the rocks the same day. As you can imagine grouting took some time, there were a lot of lines. The grout really made the rocks stand out and added to the decorative look of the floor. This is what the floor looked like just before we grouted the lines. We had to be careful not to get any epoxy into the grout lines before we grouted otherwise the grout would not bond to the substrate. After the lines were all grouted and completely dry (overnight). We applied another coat of fast set epoxy, let it dry, then a coat of urethane with a non-slip additive. 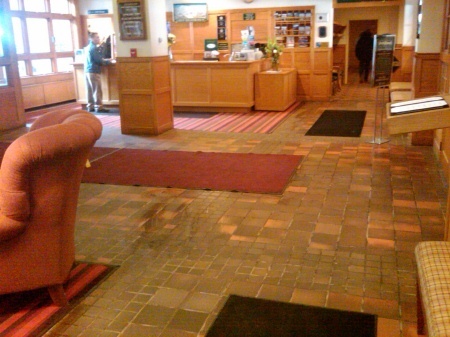 They didn't want the floor slippery with all the skiers walking on the floor in the winter. The floor came out great, the decorative concrete overlay material from Elite Crete is very strong (6500 psi), durable, and easy to apply if you have the proper training. All the materials we used for this decorative concrete overlay, the coloring, epoxy, urethane, and concrete overlay material was supplied by Elite Crete of New England. Special thanks to John Massery and Jeff Blazek of Elite Crete for all their help and support. 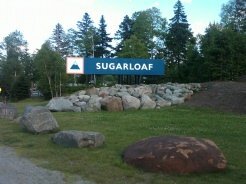 If you enjoy skiing, Sugarloaf is one of the premier Ski areas in Maine and New England. 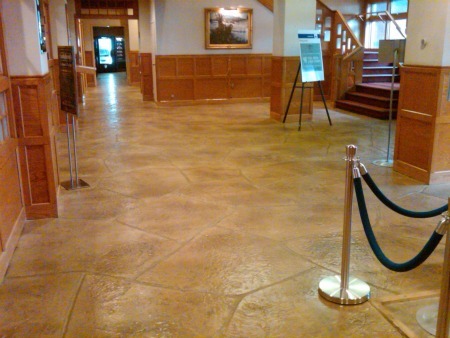 Check it out and let us know what you think of the decorative concrete overlay. 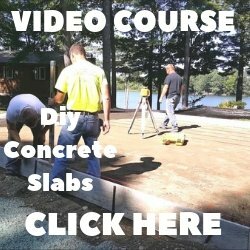 For information on other concrete overlay applications click on the links below.